Day before yesterday, Facebook introduced a few changes. The changes did not go down well with a lot of users. Well, Facebook is introducing more changes again - huge changes. The new OpenGraph and Timeline are the most important changes that Facebook announced today at the F8 event. Both the new OpenGraph and Timeline are huge - but the Timeline will be the most visible change that the users see. Let us take a look at what the Timeline is. 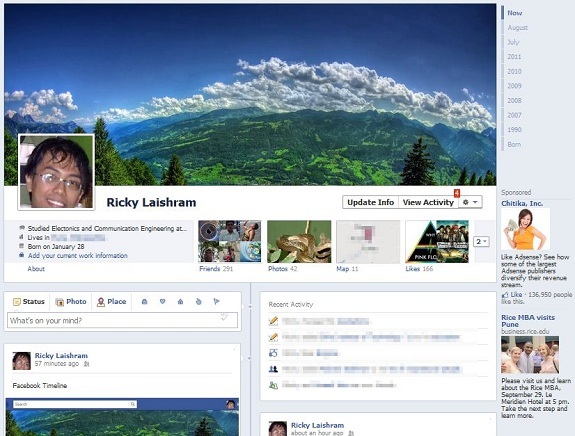 Facebook's new Timeline is a replacement for your profile page. 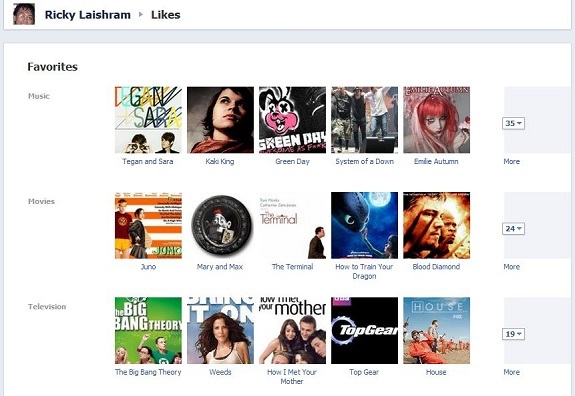 It is the chronological list of everything you have done one Facebook - the status updates you have posted, the photos you have uploaded, the places you have checked in to, things your friends have posted on your wall etc. It is a completely new way to represent a user profile. The Timeline goes all the way back to your birth. One thing that this does is that it encourages users to post old photos and other stuffs from the time before you joined Facebook or before Facebook was even created. 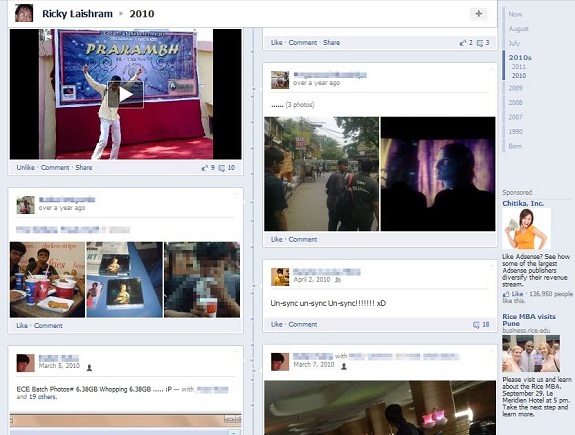 As Mark Zuckerberg said, Facebook wants Timeline to be the story of your life. Let us take a look at Timeline in more detail. This here is my Facebook Timeline. At the top there is a large picture called "Cover". You can change the Cover to any picture you want - it serves no purpose other than making your timeline look a bit better. Below the cover are the details - education, birthday etc. Unlike the old profile, Likes are now listed on another page. A new feature here is Maps. It shows all the places you have been to on a map. The main contents of the Timeline come below that. The time is represented by a line in the middle of the page and the activities - status updates, photo uploads etc. are represented on either side of the line. As you scroll down and go more in the past, only the important updates will be visible. Instead of scrolling, you can also click on the year/month on the upper right. As I have mentioned above, Likes now shown on a different page. Your favorite music, movies etc. are now shown with a much larger icon. Below the favorites on the same page, there is the history of Likes with your friends who have also liked the same thing mentioned on the right. 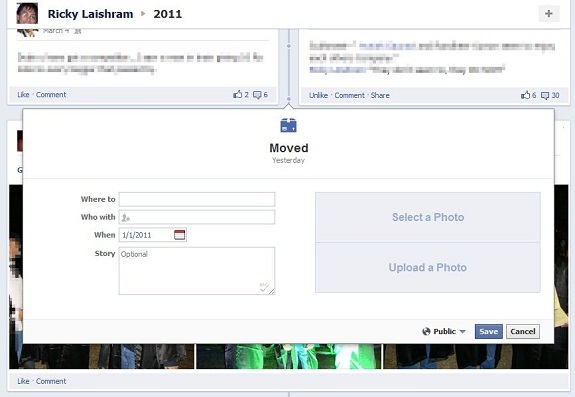 Facebook has provided you with a lot of things you can play around with in Timeline. Let us take a look at each of them one by one. As I have mentioned before, you can change your cover. To do that hover the cursor over the Cover. "Change Cover" should now show - click on that. On the drop down, click on Reposition Cover if that is what you wish to do. If you want to change it to a new image, you can either click on the appropriate menu to either upload a new photo or use an existing photo from your album. If you have something that you would like to hide from the timeline, it is very simple to do so. Simply move the cursor to the thing you want to hide. You will see a star and a pencil. Click on the pencil and in the drop-down, click on "Hide from Timeline". By default, the items in Timeline are represented in a two column format as you have seen from the screenshots above. However, if there is an important item, you can "Feature" it and have it expanded in a larger form. To feature an item, bring the cursor to the item. As in the case above, a star and a pencil will show up. Click on the star. 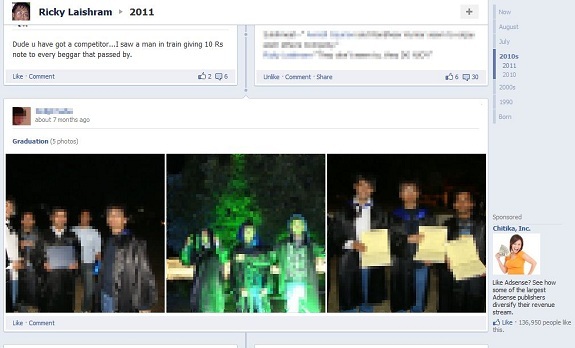 One of the most important thing about Timeline is that it encourages the users to posts stuffs about past events. In addition to the usual status, photo and check-in, there are so many other things you can mark in your Timeline such as - your graduation, getting a job, getting a pet, getting married, buying a new vehicle, moving into a new home etc. Suppose I want to add the date i moved into this apartment, which is after my graduation. To do that, I have to scroll down to the appropriate time on the Timeline and click on the middle line. I want to put the day I moved here, so I click on Living and then Moved. Then the dialog shown below comes up. I just have to enter the relevant information to update the Timeline. I can set the exact date and add a photo as well. I, obviously, do not want everyone to see this, so I can set the privacy setting at the bottom of the dialog to Friends. Once I save it, it gets added to my Timeline as a featured item. You can similarly add the other stuffs to the timeline. 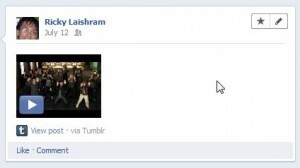 This is all there is about the new Facebook Timeline. 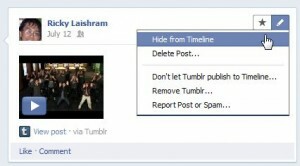 Facebook has not yet rolled out this feature, but it is already available for Facebook developers. The feature is said to be in beta and it will be opt-in at first.